Few days back while studying about the various plants and herbs that are precious to humankind, I found out particularly about one tree by the name of “Moringa Oleifera”. This plant is gaining popularity at a fast pace and is today counted as one of the superfoods for its highly nutritious value. Popularly known as the “drumstick tree” in India, moringa was named the ‘plant of the year’ in 2008 by the “National Institute of Health”. Researchers found that every part of this deciduous tree starting from its leaves, fruits, seeds, pod, roots, flowers to bark have benefited man since ages in some way or the other which led the ancient Romans, Greeks and Egyptians highly value it mainly for its medicinal benefits. Although this magical plant has various skin and hair benefits also, today in my post, I will concentrate only on the health benefits of moringa backed by scientific facts. So, if you are eager to know more about this plant, keep reading this post. Moringa oleifera is the most well known species of moringa genus that belongs to the Moringaceae family. It is native to India and is widely cultivated in the subtropical and tropical areas of Asia, South America and Africa. It has whitish-grey thick bark with fragile, droopy branches and large green oval leaflets. It can grow up to 10-12 cm in height with a diameter of around 45cm. Due to its high nutritious value, this plant helps in the general human well being and hence is aptly called “The Miracle Tree” in many Asian, African and Caribbean countries. I will discuss all the scientifically proven health benefits of moringa but before that, let me share you about the nutrients that make it such a precious plant for human beings. Several studies have found the presence of various antioxidants in moringa leaves that make it highly beneficial in treating many ailments. Moringa oleifera is a powerhouse of nutrients containing large amount of vitamins, minerals, proteins, calcium, potassium, amino acids, iron, zinc and many more. Besides, it contains very less fat and offers no bad cholesterol to your body, therefore making it healthy even for obese people. Now that you have known, the nutritious value of moringa, let us start our most important discussion about what can be the various health benefits of moringa oleifera or drumstick tree that has been scientifically proven. The nutrient packed moringa oleifera has been traditionally used in treating various diseases that has led to its huge popularity. Studies on postmenopausal women have found out that consuming moringa leaf powder for 3 months has increased the blood antioxidant levels largely. In fact, it is said to be a natural cure for diabetes, cancer, high cholesterol, anemia and the list continues. 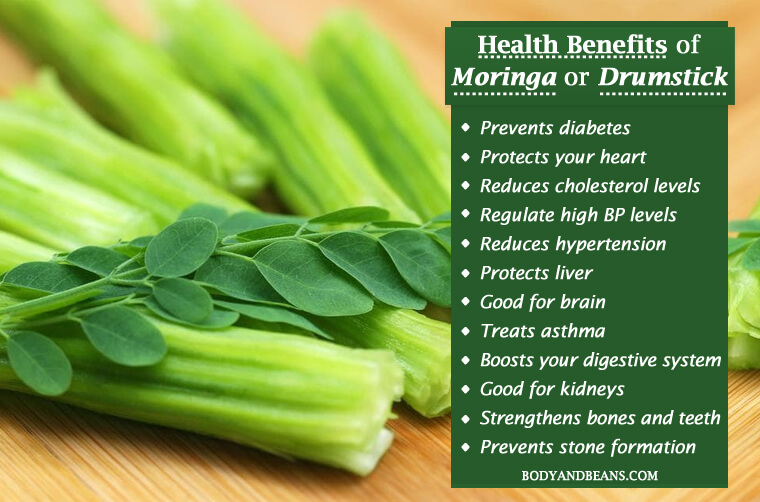 Here are the top 20 health benefits of moringa or the drumstick. High levels of blood sugar is very dangerous and may cause various health complications. It may affect your heart and the other important organs of the body. Therefore, maintaining blood sugar levels is mandatory and with moringa, you can put your blood sugar levels easily at check. The chlorogenic acid content in moringa has been proved to regulate the blood sugar levels. Another study on 30 women also proved that by consuming moringa leaf powder for 3 months, there was significant reduction in blood sugar levels by 13.5%. Therefore, moringa became a natural cure for diabetes also, which occurs due to imbalance in blood sugar levels, and there were several studies to back the fact. “International Journal of Food Science Technology” also confirmed that diabetic patients when consumed moringa as a part of high carbohydrate diet showed positive results on insulin and blood glucose levels. In fact, not just blood sugar, the immunoglobulin and glycosylated hemoglobin, the other two markers of diabetes also lessen with moringa intake. This deadly disease is currently topping the list of the life threatening diseases that has been the cause of several deaths all over the world. However, researchers have found out that the moringa extracts are beneficial to prevent and cure cancer, which is one of the most important health benefits of moringa. The phenolic compounds like kaempferol and quercetin present in moringa possess chemo-preventive properties and hence moringa is widely used in tumor therapy. Niazimicin, the bioactive compound present in it has also been proved to restrain the growth and the development of cancer cells. In addition, the chemo-modulatory effects of moringa make it a perfect cure for various types of cancers like ovarian cancer, skin papillomagenesis and hepatic carcinogenesis. Moringa inhibits the rapid growth of malignant cancer cells and hence is safe for the cancer patients. It is also a cure for breast and colorectal cancer as well. Heart is the most important organ in your body and with moringa, you can protect it and prevent the occurrence of several cardiovascular diseases. The various antioxidants present in it helps to check the risk of heart attacks and strokes that has taken innumerable lives in the recent past. Moringa helps to inhibit the lipid peroxidation to increase in the myocardial tissues and hence keeps our heart healthy. With adequate moringa intake, you can control high blood pressure, high cholesterol and hypertension, those that put your heart at risk largely. Reduces cholesterol levels– In order to keep your heart healthy, the cholesterol levels in body must be regulated. Moringa helps to lower the high levels of cholesterol in body and hence reduce the risk of strokes and heart attacks. Controls your high blood pressure levels– Having high blood pressure also puts your heart at risk but with moringa you may keep the pressure levels under control. The powerful antioxidant quercetin present in moringa reduces the levels of blood pressure in human body. Reduces hypertension– Excessive tension can affect your heart severely but moringa helps you to control it. The presence of bioactive components like niaziminin and isothiocyanate prevents the arteries from thickening and inhibits the development of pulmonary hypertension. You can protect your liver with the moringa extracts. Various studies have proved that moringa is highly beneficial and often recommended in case of the liver damages that are caused by the anti-tubular drugs. Phytochemicals like catechin, ferulic acid, epicatechin and vitamin C present in moringa helps your body speed up the recovery process. They facilitate the process of restoration of glutathione levels in your body as well as prevent hepatic lipid peroxidation induced by radiation. Adequate intake of moringa is beneficial for better cognitive function. It is good for better retention of memory and helps in alteration of brain monoamines such as norepinephrine, dopamine and serotonin. Besides, it provides protection against Alzheimer’s disease and its monoaminergic deficiencies. In addition, moringa being rich in protein and amino acid tryptopohan produces serotonin hormone that in turn helps to control your mood swings, maintain energy levels, and help fight depression, fatigue and insomnia. People who suffer from asthma or has asthma tendencies may take help of moringa to ease their problem. Studies have shown that it cures any kind of inflammation in the airways and also relieves you of bronchial asthma. Many treatments of asthma involve moringa as it reduces the frequency of asthmatic attacks and its other symptoms like wheezing, dyspne, cough, and chest contraction that accompany it. Various studies have proved moringa’s effectiveness in treating several allergic diseases like anaphylaxis and allergic rhinitis. It also gives you protection from bronchial constrictions as well as aids in the proper functioning of your lung and respiratory system. Moringa boosts your digestive health and since ancient times, it is considered the perfect remedy for treating stomach disorders as well as other digestive issues. Due to the presence of isothiocyanates in it, it has the ability to treat several adnominal issues like the problem of gastritis, constipation, diarrhea and ulcerative colitis. The anti-inflammatory properties of moringa enable it to fight various germs and make it the perfect detoxifying agent that flushes out the harmful metal toxins from your body. It inhibits the growth of disease causing pathogens and cures various bacterial, yeast or fungal infections. The Vitamin B present in its leaves further aids in the digestive process and enables smooth conversion of food into energy instead of storing them as fats. Kidney failure or kidney problems can lead to many health problems, so the early you protect your kidney, the better and moringa will help you in it. Studies show that you can prevent nephrotoxicity, a kidney problem that mainly occurs due to the toxin or drug exposure with proper intake of moringa. Besides, the presence of antioxidants in moringa extracts gives protection against the renal injuries and also intensifies the recovery process in body. It is an ideal bio-absorbent that helps your body to wash off the harmful toxins and heavy metals that are bad for your kidneys. With age, our bones and teeth get weak and they need to be taken care of. However, there is nothing to worry as if you consume moringa in adequate amounts, you will be able to make them strong again. The presence of calcium and phosphorous present in it contribute to bone and teeth health and prevents them from breaking fast. Also, due to the anti inflammatory property of moringa, you can treat the problem of arthritis with it as well. Besides, various bone related problems like jawbone fracture or mandibular fracture can be treated with moringa extracts. Last but not the least, the magnesium content also keep the teeth strong and prevent its falling early. Kidney stones, bladder stones or uterus stones are quite common nowadays but moringa extracts helps to prevent the formation of these stones. Various studies have shown that the moringa roots possess certain anti-urolithiatic property that can reduce the urinary oxalate levels in body. Moringa extracts also inhibits the development of stone deposits and regulates the synthesis of endogenous oxalate. Moringa oleifera is good for your eyes. Several studies proved that moringa has retinoprotective ability and can aid your body to cure any retinal damage. Moringa prevents the retinal vessels to dilate, thereby facilitates the retinal vasculature to remain intact. Besides, moringa prevents the capillary membranes to thicken which in turn lessens the risk of retinal dysfunction. You can treat your problem of cataract with moringa as well. . Anemia that is so common especially with middle-aged women can be prevented with proper intake of moringa oleifera. Research has shown that moringa promotes the absorption of the iron by your body, which in turn helps to increase the levels of red blood cells and maintain the overall blood parameters in your system. Moringa is good for all the pregnant mothers as well. The nutrients present in moringa have the potential to increase the stamina and give a lot of energy to the would-be mothers. Moringa also provide them with the perfect prenatal nutrition mainly the supply of iron and calcium that is highly beneficial during pregnancy. Moreover, it is said to improve the lactation or breast milk production in mothers. So, moringa intake is highly favourable for pregnant mothers but one must still take doctors permission before consuming it. This disease is generally hereditary where there is some sort of problem in the hemoglobin- beta gene in chromosome 11. This defect leads to abnormal hemoglobin molecules and causes the red blood cells to die early. It also blocks the flow of blood causing pain. However, moringa gives you protection against this sickle cell disease as well. Various studies have proved that the zinc content, the flavonols like quercetin, kaempferol, and acacetin as well as presence of phenolic acids like vanillic acid and melilotic acid, together contributes to the anti-sickling property of moringa. Moringa extracts can treat the problem of edema in which there is swelling due to the fluids getting trapped in the tissues. But moringa is believed to cure it and according to studies, it is the anti-inflammatory property of the moringa roots, which inhibit the development of edema. Studies also found that the efficiency of moringa herb in treating painful condition like edema is equivalent to the potent anti inflammatory drug indomethacin, which was so far thought to be the best cure for edema and other painful swelling conditions. Moringa oleifera has excellent wound healing properties. You may easily apply it on your wounds and cuts as according to reports, it has the ability to reduce the clotting time. In other words, it lessens the time taken for the wounds to stop bleeding. Besides, it fades the marks of the wounds and the scars quickly leaving behind clear glowing skin. Also, it increases the skin- breaking strength and reduces the scar area. Your immune system helps you to stay healthy and strong. So the stronger your immune system, the healthier you will remain. Moringa has number of health benefits with strengthening your immune system being one of them. The ethanolic content present in the leaves of moringa enhances the immune response of the cells. It also facilitates the functioning of other immune system values like antibodies, leucocyte count and hypersensitivity reaction. Moringa being a perfect antimicrobial agent prevents the growth of the disease causing microbes. They also give protection against water-borne microorganisms and foodborne microorganisms as well. All these together boost your immune system and help you lead a healthy, diseases free life. Moringa oleifera can be used in various ways to treat several health issues. So let us discuss some of the common ways in which you can use moringa in your day-to-day life. Consume moringa in the form of tea. Steep the dried moringa leaves in hot water. Strain it and then drink it. Try to avoid boiling it in order to retain the maximum nutrients in it. The moringa tea is generally light and has an earthy taste. You may also add moringa powder to your smoothie and then drink it. This is one of the healthiest smoothies that taste good as well as is highly beneficial for health. You may also pop moringa seeds like popcorn with some butter. You can cook the moringa seeds like peas and consume them along with other meals. The moringa leaves can be eaten as salads or may be added to pasta, rice or some other dish. Moringa leaf powder may be sprinkled on soups or added to any other foods while cooking. However, try to add them at the end of cooking or just before you eat them in order to get the maximum nutrients. The moringa pods may be boiled, fried or steamed. You may consume them in any way just like green beans. Lastly, there are various moringa or drumstick recipes. You may do a bit of online research and include them in your diet chart in the way you want. Honestly, there can be no particular way to incorporate moringa in your diet regime. Innovation is the key. So feel free to experiment and reap the maximum health benefits of moringa. Moringa is very beneficial for your health but there are few side effects of it as well, that you must keep in mind. Firstly, remember that you need to give some time to your stomach for it to get accustomed to any new food, so it is best to start eating moringa powder ½ to 1 teaspoon daily. You may increase its dosage a bit after few weeks. But make sure you do not overdo it as moringa if eaten in large amounts can have laxative effects and may lead to stomach upset, gaseous distension, heartburn and diarrhea. As far as seeds are concerned, they has a certain level of toxicity in it, so it is best to eat only a handful of seeds that is around 2-3 a day. According to some studies, it is preferable to eat moringa after cooking, as eating it raw resulted to heartburns in few cases. Lastly, although researches have proved its efficiency in case of pregnant mothers, my advice will be to eat only under medical advice during such conditions. This is because the chemicals in the bark, roots or flowers of moringa may lead to uterus contraction that in turn may create pregnancy complications. Therefore, it is always better to be safe from before. However, there is nothing to worry so much. Just remember not to overdo its consumption. Eat in moderate amounts and enjoy its health benefits. Undoubtedly, the health benefits of moringa or drumstick make it the new superfood, which you can vouch on. It is good for your heart, liver, lung, kidney, eye, stomach and can also fight several diseases like cancer, diabetes, anemia etc. Hence, it is mandatory to include it in your diet chart. All the parts of the moringa plant are good for humans in some way or the other and hence you can incorporate it in your food regime in several ways. You can consume it in the form of tea, or use it in a shake or smoothie or can use it in various recipes. But, despite its good effects, you must never ignore the precautions. As you know nothing in excess is good, so try to eat them in moderate amounts and if you are pregnant, please consume only on doctor’s advice. Do you like moringa? Have you noted the health benefits of moringa? Do share me your feedback whether you have benefitted from eating moringa and feel free to suggest any moringa recipe that you find to be really tasty as well as healthy. Also, please do like and share if you find my post beneficial. Until then, stay healthy, stay safe.